Playwright Dwayne Yancey with The Reverend Billy C. Wirtz. 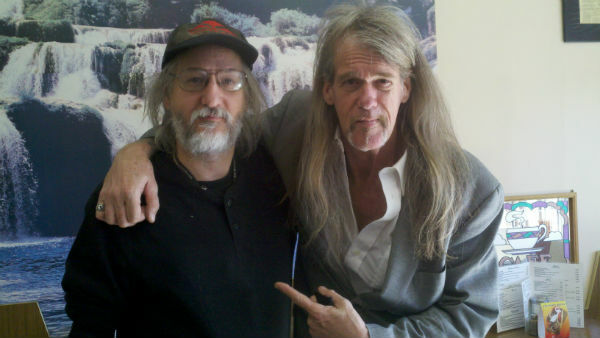 Over the weekend, I caught up with an old college buddy of mine — the Reverend Billy C. Wirtz. The title is real, if you believe in mail-order preacherhoods. “Reverend Billy,” as he’s been called since his college days at James Madison University, is a musician. Specifically, a master of boogie-woogie piano, with a touch of comedy on the side. He’s been called the ” Bertolt Brecht of the Bible Belt.” His 1990 album “Backslider’s Tractor Pull” won an award for Comedy Album of the Year by the National Association of Independent Record Distributors. Now based in Florida, Reverend Billy has been off the road for a few years but is back out at it again. On January 31, he opened his new tour at Roanoke College. I caught up with him the next day for lunch (well, lunch for me, breakfast for him) at Bobbi Joe’s in Salem, where a friendly waitress took this photo. Not familiar with The Reverend? Here’s his signature tune, “Mennonite Surf Party.” Enjoy. This entry was posted on February 4, 2014, 11:05 pm and is filed under Personal. You can follow any responses to this entry through RSS 2.0. You can leave a response, or trackback from your own site.